Family road trips are an American family tradition, but they do come with their share of stressful moments. Planning is a very adult thing to do, but you have to remember that it’s all about the kids. You’ll want to do everything in your power to ensure they have the time of their lives. You’re making memories that will last a lifetime. Just a little preparation goes a long way to help ensure every memory is a good one. Here are some road trip precautions you can take to help everything go smoothly. The most important part of any road trip isn’t the playlist, although that’s also crucial. It’s the car itself. If your car isn’t ready for the voyage, you run the risk of getting stuck on the side of the road with a car full of kids. Now, that’s a memory anyone would rather skip. Be sure you get an oil change before you take the trip. Most mechanics will also top off your fluids and check your tire pressure. Ask your mechanic to perform a brake inspection and check the tire tread too. For some people, road trips are a time to relax. But that’s not usually the case for kids. 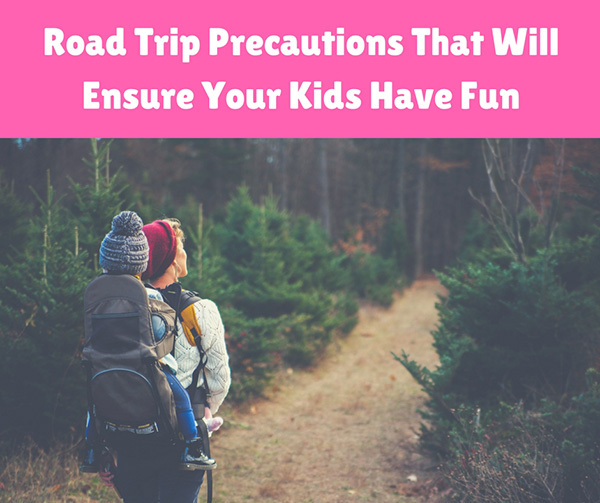 If you want them to be on their best behavior, kids need to remain entertained throughout the ride. There are many ways to keep your kids busy, but snacks are a favorite. Bring a few different types of snacks to keep things interesting. Not only will the food keep your kids busy, but it will also keep them from getting hangry on the ride. No one wants to be stuck in a car with hangry kids. The activities you choose will depend on your kids’ ages and interests, but some fun ideas include games (think eye spy), coloring books, electronics and mad libs. Even though your car will likely be a mess when you get to your destination, it’s still worthwhile to organize. Why? Well, if you’ve ever been on the highway and had to rummage around in the back seat for something, you know why. We’ve all been there and it’s not fun – and potentially dangerous. If you have everything you’ll need in a backseat organizer, it’ll be easier to grab in moments and get your attention back to the road. If you’re lucky, the kids may even put stuff back into the organizer, so you can retain some sense of order. Also, keep some empty bags in your car for trash. It’ll be easier to empty out your car at rest stops this way. You’ll be able to stay more organized with less trash laying around. Organizing isn’t necessarily fun for the kids, but it’ll keep you from getting frustrated, which is good for everyone. Road trips make some of the best memories, so buckle up and get ready to have the time of your life!